How can it be August? July - and the rest of the year, come to think about it - has flown by and it's (supposedly) summer already. 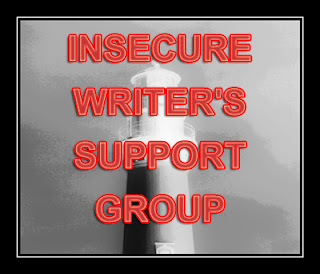 Anyway, the beginning of August means another chance have a moan, wobble or moment of pure triumph during the Insecure Writer's Support Group. This month I'm wondering how on earth I am meant to cut my book down by 10,000 wordsish. I wrote far too much and now I've got to reign it in. I've been having a think about it while the book is 'resting' and I know a few scenes/minor plotlines that can go but 10,000 words worth??? I guess I won't know if I can pull it off until I get on with it but at the moment I'm shaking my head in wonderment as I imagine myself snipping at my book rather than gouging chunks out. I must be brave and find 10,000 words of crap or unimportance. If it doesn't add any real value to the story or move the plot along, it must go. 10K isn't nearly as much as you think! I cut Game On by more than 60K, which might just mean my first draft was terrible lol! Once you start reading it back, you will probably find it is easier than you first thought. Good luck with the editing! I'm sure that once you get into the swing of 'cutting', you'll be okay. Hi Michelle :-) Thank you for visiting my blog too! You're right - in a huge chunk it seems massive but I'm sure there'll be bits here and there that can go or the writing tightened up. Yep, it definitely needs doing. I think (hope) it'll make a better book once I'm done. Recipricating the visit via IWSG, and especially to thank you for your quick supportive words against my own fears. Although reading your post, I have to admit - I have about 10,000 words myself to cut, *grins*. I love cutting because I usually realize I didn't need the scenes I cut, and it makes the book so much cleaner without them. Best of luck!